This is the second in a two-part series that takes its name from Donald Shoup’s ground-breaking book “The High Cost of Free Parking”, first published in 2005. Shoup documents the many unintended effects of free parking in cities, and many of his proven principles could apply to trailheads in our public lands, as well. The second part in this series explores some possible solutions for the parking crisis facing the trailheads of the Columbia River Gorge and Mount Hood, and the value of confronting the true costs of free parking to our most treasured public lands. Does anyone really expect free parking at a Timbers or Blazers game, or drop in for dinner without a reservation at one of Portland’s finest restaurants to find a table waiting? Or be exempted from tolls when crossing the Columbia at Hood River and the Bridge of the Gods in Cascade Locks? Of course not, but that doesn’t mean we don’t reserve the right to complain about it! That’s human nature. Such is the dilemma for public land managers face as they attempt to impose limits on access to our trails on Mount Hood and in the Gorge. While we can all probably agree that the impacts we now see from overuse require limits on access, we’d probably like someone else to suffer the inconvenience. The good news is that our most overused trails are relatively few in number. Any seasoned hiker can rattle them off, as many already avoid these trails on popular weekends and seasons: Angels Rest, McCord Creek, Wahclella Falls and Eagle Creek in the Gorge are now infamous for their crowds, while Ramona Falls, Mirror Lake, Salmon River, Elk Meadows and (most recently) Tamanawas Falls on Mount Hood see overflowing weekend crowds. Experienced hikers already know where the lesser-visited trails are and make a point of steering toward these places for a quieter, better outdoor experience. However, as the Portland region continues its rapid growth, even some of these “secret” trails are starting to show some strain: Herman Creek, Starvation Ridge and Gorton Creek in the Gorge and Vista Ridge, Bald Mountain and Cooper Spur have all seen spikes in use over the past decade or so as hikers seek less crowded trails. We have met the enemy and he is… us! The first step in adopting a trailhead parking policy to address overcrowding is to recognize the problem: when trailheads routinely overflow, it’s a problem! You can see this on weekends on every one of the overcrowded trails mentioned above. 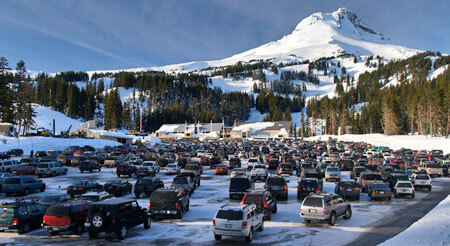 The crowding is now year-round in the Gorge and whenever the ground is snow-free up on Mount Hood. For some trails, like Mirror Lake and Eagle Creek, the crowds extend beyond the weekends, especially on Fridays and Mondays. But even on these most heavily used trails, weekdays usually mean plenty of parking to spare, with no overflow. This variation in day-to-day use at the most crowded trailheads is a case study for variable parking fee, with fees set higher on weekends and holidays, and lower (or not at all) on weekdays. As Donald Shoup demonstrates in “The High Cost of Free Parking”, adopting such a strategy can shift weekend and holiday use to less popular trailheads with free parking, or to non-peak days at more popular trailheads. If we adopted a variable pricing policy tomorrow for overused trailheads in the Gorge, we could cut weekend crowding on trails now being harmed by overuse in half, overnight. Sounds easy, right? Well, one complication comes from the public blowback that would almost certainly occur. Remember, we all reserve the right to complain when things aren’t free! Another complication comes from the fact that several of the most popular trailheads also have heavy tourist use. Places like Horsetail Falls, Wahkeena Falls and Multnomah Falls in “waterfall alley” are good examples where the majority of peak period visitors aren’t hikers, just people touring the Historic Columbia River Highway and walking the paved paths to the most famous roadside views. Shared tourism and hiking trailheads should be priced, too, as they fit the same definition for overcrowding with parking spilling far beyond established parking areas. Crowding is crowding. The impacts of overuse in the Gorge are real and jarring. This boot path cutting a switchback on the Oneonta Creek trail formed in just the past two years. At Multnomah Falls, a new hazard has emerged from the overflow on weekends, with visitors now parking beyond the narrow historic highway viaducts that flank the falls and lodge. Signs on the viaducts sternly warn against pedestrians walking along them, but whole families are now a common sight in the narrow viaduct vehicle lanes on busy spring and summer weekends at Multnomah Falls. At Oneonta Gorge, the huge overflow of visitors has created a hazard for hikers attempting to scale the log jam at the mouth of the gorge, and ruined the outdoor experience for those who make it beyond the log pile with a noisy, carnival atmosphere. …a testament to the destructive behavior that allowing large crowds to from on our public lands can foster? Worse, the overcrowding at Oneonta has led to a shameful degree of vandalism in the recently restored highway tunnel. Would vandals pay to park here? Perhaps, but at least the crowds that lead to that sort of destructive behavior could be prevented with managed parking. 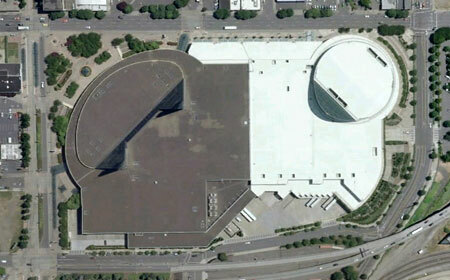 Otherwise, this precious gem will likely have to be closed to the public, once again. At Mount Hood, overcrowding at places like the Salmon River Trail and Ramona Falls has also led to vandalism and car break-ins, in addition to heavy impacts on trails. Managed parking could greatly improve the situation here, while allowing hikers to discover the many lesser-used trails on Mount Hood that could benefit from more boot traffic while providing a far better hiking experience. In many of these examples, a parking pass is already required today, but this has little effect on managing peak use. The key difference is variable pricing for parking that provides an incentive for visitors to avoid peak periods at the busiest trailheads, but gives options of other trails or off-peak days when little or no parking fee is charged. It’s a proven approach whose time as come in our most visited public lands. Since proposing a “Boot Loop” transit service on this blog four years ago, we’ve seen significant steps forward in providing transit service to Mount Hood and the Gorge. The Mount Hood Express now provides daily service from the Portland area and on the Washington side of the Gorge, transit service now connects to Stevenson, with a new shuttle to Dog Mountain. The new Mount Hood Express bus provides daily service to the mountain. On the Oregon side of the Gorge, the Oregon Department of Transportation (ODOT) is partway through a pilot project to bring transit service to the most heavily visited spots in the Gorge. ODOT plans to provide service from a park-and-ride location inside the Portland area to the most popular trailheads in the Gorge. Transit service provides a needed option to driving, especially for those who do not have access to a private vehicle, but also to those who simply want to avoid the hassle of driving (and parking). Transit is also a good counterpoint to adopting a parking strategy for the Gorge and Mount Hood, as parking fees provide an incentive to use transit during peak periods, which in turn, helps provide the critical mass to keep the service going. This is a tried and proven relationship between parking policy and transit in cities, and overdue as a strategy in our most heavily used recreation sites. That said, transit is mostly a way to provide another option for visitors. It simply won’t have the capacity to have much impact on overall visitation during peak periods, when parking areas at our most popular trailheads is already overflowing to two or three times the planned capacity for the trail. Applying Donald Shoup’s parking management practices to recreation areas is less complicated than in an urban setting for the simple fact that there are so few places to manage, most have a single entrance point and they are all in public ownership. The Forest Service recently completed a major remodel of the Wahkeena Falls wayside to better manage crowds, but without managing parking, this new landscaping doesn’t stand a chance of surviving the overload. The public reaction to actually putting a price on parking at our busiest trailheads, even during peak periods, is the driver for why we aren’t already attempting this – not the complexity of actually making it work. After all, cities around the world are already doing it, and against much more complex obstacles. These systems are all being used in cities today, and some combination of these practices could be applied to parking on our public lands. One challenge for public lands would be on-site enforcement, however, as this is an essential ingredient for urban parking policies. On this point, I propose that a portion of the trailhead parking revenue could be steered toward dedicated county law enforcement to patrol parking areas. Not only would this provide an essential incentive for visitors to pay their fee, but it would also bring a much-needed security presence for busy trailheads that are increasingly targeted for car break-ins. The Starvation Creek wayside does triple duty as a popular trailhead, wayside for tourists and freeway rest stop. This site is a candidate for a combination of short-term timed parking and long-term fee parking. So, how much revenue does a parking strategy generate? Well, consider that the City of Portland collects some $35 million annually in parking fees from its downtown meters, which in turn contributes to the city’s transportation budget for street maintenance. The city also collects another $7 million annually in fines for parking violators, more than enough to cover its enforcement costs. While a parking strategy for the Gorge or Mount Hood would be unlikely to bring that much parking revenue, the Portland model does show that fee parking at the most popular trailheads in the Gorge and on Mount Hood could not only cover operational costs, but also bring new revenue for woefully underfunded trail maintenance and construction. That could be a valuable selling point to regular hikers and visitors. One of the institutional obstacles to adopting a coordinated parking strategy for the Gorge, in particular, is the mix of land management agencies involved: the U.S. Forest Service, Oregon Parks and Recreation Department (OPRD) and Washington Department of Natural Resources (DNR) all have some sort of parking permit that applies to some of their respective recreation sites. Welcome to Wahclella Falls! Forest Pass or $5 fee required… here. The Forest Service and OPRD both have a mix of free and fee sites, with the Forest Service requiring a $30 annual Northwest Forest Pass or $5 day-use fee at places like Eagle Creek or Wahclella Falls, but no charge at its busiest locations like Multnomah Falls, Horsetail Falls and Wahkeena Falls, where tourists outnumber hikers. OPRD charges $5 day-use fees at places like Rooster Rock and Benson Lake, but not at busy trailheads like McCord Creek and Latourell Falls. Meanwhile, on the Washington side of the Columbia, DNR charges a $30 annual fee or $10 daily fee for its Discover Pass to park at places like Beacon Rock, Hamilton Mountain and all other Washington State recreation areas. All of these are flat-fee permits, so they do nothing to help discourage overcrowding on busy weekends and arguably encourage more use, since an annual fee provides a flat rate for unlimited visits. In fact, the annual passes do just the opposite, encouraging multiple visits for a flat rate. There’s nothing wrong with hikers spending a lot of time in the Gorge, of course, but we all share the burden when it comes to managing the impacts through trailhead parking fees. It’s unclear how much revenue is left for trails once administration costs for the Northwest Forest Pass are covered. Today, trailhead permits are pitched for their ability to generate funds to build and maintain trails, but hikers are rightly skeptical about how much funding actually goes to trails. In the end, it’s not a problem of the trail passes, but rather, by the low fees relative to the trail impacts the most popular trails are experiencing. For example, a hiker purchasing an annual permit for $30 and spending a dozen days in the Gorge or on Mount Hood each year pays just $2.50 per visit to cover their trail impacts, or less than many hikers will spend on coffee en route to the trailhead. Lots of passes and hassle, not much revenue for trails… and no impact on crowding. There is little chance the states of Oregon and Washington and the U.S. Forest Service will ever join forces and create a unified trail pass, and besides, their pass systems aren’t effective at managing peak use, anyway. Instead, they should cooperate to adopt a pricing strategy for our most overused trails that is an add-on to (or replacement for) the existing pass system at these locations. The ethics of putting a price on parking? At this point, you might be thinking (as I generally do) that we should all enjoy free access to our public lands. Of course we should! We pay for tem every April 15, after all. Thus, adding parking fees at our overused trails will most certainly bring howls from avid hikers who spend a lot of time on the trail, and who dutifully purchase their $30 annual trail passes now. Would revenue from a parking policy bring more of this to the Gorge and Mount Hood? Almost certainly, if managed properly. Yet, when overuse starts to bring the “tragedy of the commons” to our most cherished places, it’s time for all of us to step up and find a solution. Putting a price on parking is a proven and effective way to get there. More importantly, pricing is really only needed on our most heavily traveled trails. Most trails will continue to be “free”… of a parking fee, anyway. Putting a price on parking arguably discriminates against people with limited incomes or who are unable to visit in off-peak periods when little or no fee is required. Land managers will therefore need to consider ways to ensure that everyone can visit our public lands, no matter their ability to pay. But such programs are already in place in several state and National Parks, and could be easily included in a Gorge or Mount Hood parking strategy. That’s no road – it’s what the Angels Rest trail has become in recent years, thanks to massive overuse from a complete lack of parking management at the trailhead. Today, land managers are already beginning to put restrictions on overflow parking in the Gorge and on Mount Hood. It’s a good first step, but not enough to address peak demand on weekends and holidays, and in the end will mostly frustrate visitors who have arrived expecting place to park. The next step for our public agencies is to start managing parking, itself. It’s long past time to try it in the Gorge and on Mount Hood, for the sake of our trails and most treasured places. First-timers arriving at the Mount Hood Meadows resort in winter are greeted with a handsome view of the broad southeast face of the mountain — framed by a giant, mall-sized parking lot. Since the resort first opened in 1967, the parking lot has been a continued bone of contention for mountain defenders. The original 6-acre lot covers what were once mountain meadows and groves of ancient subalpine fir and mountain hemlock. Growth rings in trees cut on nearby ski slopes show the cleared forest to have been upwards of 200 years old, and among the oldest alpine trees on the mountain. The lot has since been augmented by a 3-acre overflow lot in the forests below, and the 5-acre Hood River Meadows satellite lot built in the late 1970s. The resort master plan calls for another 8 acres of parking, which would bring the total for Meadows to an equivalent of 22 city blocks of high-elevation pavement. 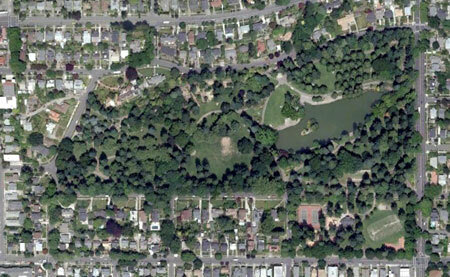 A visual comparison of the main Meadows lot (center) to Elk Cove, on Mount Hood's north side and a similar footprint in downtown Portland. But the deed is done, and Meadows has begun to respond to pressure to minimize expansion of the lot to the extent that buses are now used to transport a few skiers. But the long-term solutions must include variable fees on parking and lift tickets that help even out the demand to park at the resort, and prevent the huge weekend crowds that drive parking pressures (as well as highway congestion). This will surely be fought by the resort operators, but they’re running their business on leased, public land. You and I own the parking lot, and the land under the lodge and every lift tower the resort operators have constructed. So it’s fair to say “enough is enough” as the land owners. And enough IS enough for the Meadows resort. From this point forward, the operation should focus on reducing parking, not expanding it. What would pricing do to help manage parking? Done correctly, and in tandem with lift ticket prices, variable pricing would distribute traffic on Highways 26 and 35 in a way that prevents traffic jams on weekends, and pressure to expand these routes for a few skiers. It would also reduce lift lines, and pressure on lodge facilities. But most of all, it would allow the parking lot at Meadows to stop growing — an eventually, be reduced in size. Ski buses at Meadows are lost in the sea of automobiles - a fact that must change in order to reclaim some of the paved areas, and restore sustainability to the resort. Why should the current lot be reduced in size? Because the design of the main lot has a substantial impact on the headwaters of the East Fork Hood River, which flows around the east perimeter of the parking area, then plunges over lovely Umbrella Falls — just 300 feet from the south edge of the lot. As might be expected, the splash pool of the falls is littered with debris tossed out by skiers, then blown into the stream by snowplows. Worse, sand and gravel blown from the roads is rapidly silting the stream, filling once-deep alpine pools with sediments that the natural stream flow cannot hope to keep pace with. New innovations in urban parking lot management provide good examples for the Meadows resort to follow, including bioswales and pervious paving designed to contain and treat runoff. These concepts could be applied immediately, and with proven results. Across the country, storm water mitigation is being designed into new parking lots, and retrofitted into existing lots to protect water supplies. A more permanent solution would be an undergound, structured lot that wouldn’t require plowing, and wouldn’t add any surface runoff to the stream system. A working example is the lot under Capitol Mall, in Salem — few visitors realize that the lush gardens and fountains framing Oregon’s Capitol dome are actually the roof of a parking structure. In the long term, this could provide the best solution for Meadows, and would be welcomed by skiers who now tromp through grimy parking lot slush and rows of muddy cars to reach the lodge. Lovely Umbrella Falls splashes just a few hundred feet from the Meadows resort. Sadly, the falls is littered with parking lot debris blown by snow plows. The Meadows resort operates under a permit from the U.S. Forest Service, and can be clearly be regulated into these changes, based simply on environmental considerations. 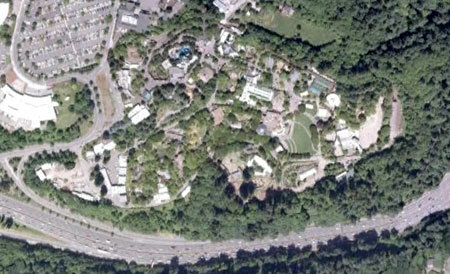 But the political reality is that the resort would likely need an economic incentive to rehabilitate the lot. One option is to simply subsidize the development of structured parking, in tandem with an a pricing program and meaningful transit to the resort. This has been done at some of Portland’s suburban light rail stations, for example, with marked success. Another option would be to allow Meadows its long sought after overnight lodging in exchange for a major upgrade to its parking lots and transportation program, and a parking lot lid would be an excellent spot for new lodging. In the end, undoing the parking lot damage is part of adopting a new ethic for the Meadows resort that goes beyond what is now largely a token marketing facade of “sustainability.” It’s time to expect more from the corporate tenants of our public lands.